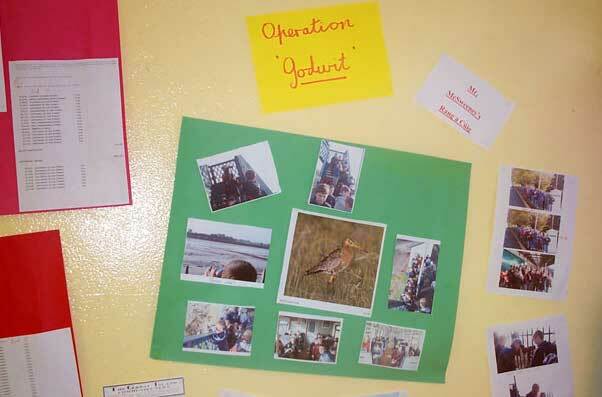 Operation Godwit is an international association of people studying the Icelandic Black-tailed Godwit. The aim of the project is to unravel the mysteries of the life cycle of this elegant wading bird. This is done by carrying out fieldwork in different countries and by following movements of individually colour-ringed birds. 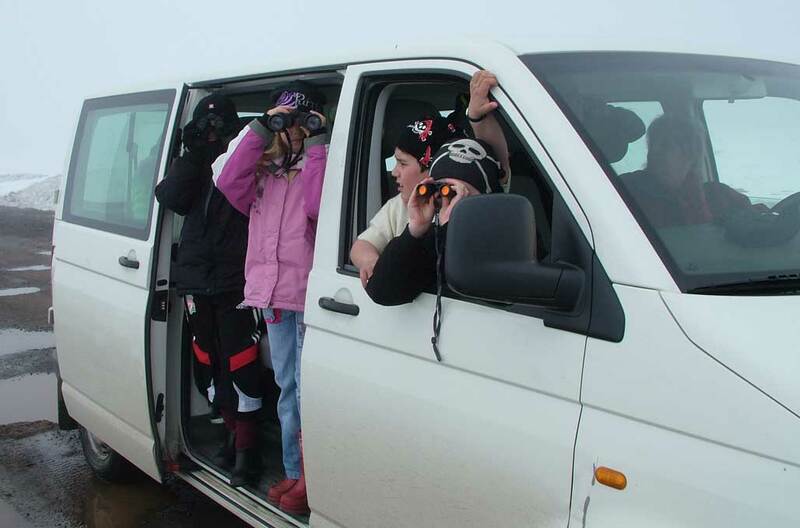 The project relies on bird watchers and interested people reporting sightings of the colour ringed godwits. Böðvar Þórisson releasing a colour ringed adult Black-tailed Godwit in northwest Iceland. The theme of this co-operative international study is to link what the birds do on the wintering and breeding grounds in order to understand the factors that regulate the population size of a migratory bird species. Some of the questions the project is trying to find answers for are below. Some of these questions have been answered while most still require more research. · How big is the population? · Why is the population increasing at present? · What routes do the birds take between and within countries? · Are individuals faithful to breeding and wintering areas and, if so, what factors influence faithfulness? · What determines site selection and habitat quality on wintering and breeding grounds? · Do birds wintering on more favourable sites arrive earlier on the breeding grounds? · Do earlier arrivals breed more successfully? · Do early breeders and their offspring have an advantage on the wintering grounds? A colour ringed Black-tailed Godwit in Iceland. · To use the scientific network and research to facilitate conservation of coastal ecosystems and migratory birds, through public education and awareness raising. · To encourage as many people as possible to get involved and enjoy this exciting work. Why use colour rings to study the godwits? As all Black-tailed Godwits look the same to us if we want to find out more about their lives and needs we have to be able to identify them individually. On of the best and safest ways of doing this is by placing a unique combination of coloured plastic rings on their legs. Because Godwits are big birds with long legs the colour combinations can be read with binoculars or a telescope without having to catch the bird again. The fact that they can fly between Ireland and Iceland and rear a family each year shows that colour rings do not harm the birds. 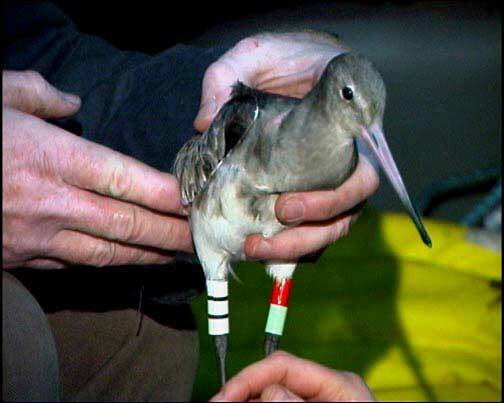 The first Cork colour ringed Black-tailed Godwit, filmed three years after it was caught and colour ringed. -Currently, ca. 2% of the total population is individually colour-ringed. 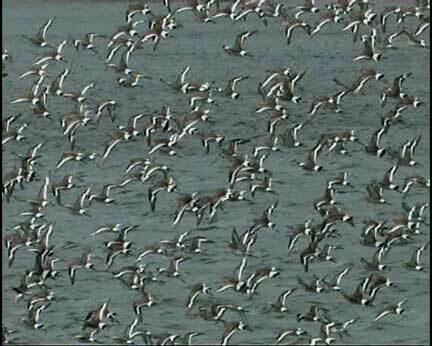 -Over 8000 sightings of colour-ringed godwits are on file. -Over 90% of adult godwits ringed in Iceland are seen in other countries. -Around 20% of unfledged godwit chicks ringed in Iceland are seen in other countries. -Almost 25% of godwits ringed on the wintering grounds are seen in Iceland every year. The Black-tailed Godwit Project in Cork harbour. Pete Potts at Brown Island, Cork Harbour, with the first Black-tailed Godwit to be colour ringed in Ireland as part of the project. 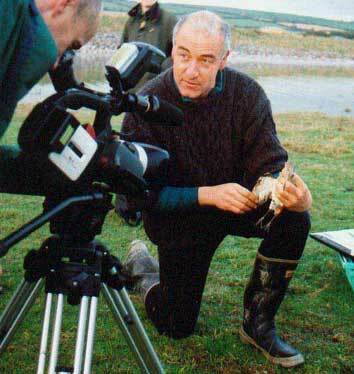 Barry O'Mahony, chief ringer of the Brown Island mist netting sessions. Over 1,000 Icelandic Black-tailed Godwits use Cork Harbour every year and so it is internationally important for this bird. Each year colour ringed godwits ringed in Iceland, Britain, France and Portugal are seeing around the harbour. Black-tailed Godwits can be very difficult to catch and only after three attempts was the first one caught for this project in Cork harbour by an international group lead by Pete Potts from England. Pete and his team have been traveling to Iceland each summer since 1998 to catch and colour ring the godwits. Many of the colour ringed godwits we see in Ireland have been ringed by Pete and his team. Since the early winter of 2006 mist netting sessions have started at Brown Island in the harbour and the team led by head ringer, Barry O'Mahony, have succeeded in catching and colour ringing a second Black-tailed Godwit. The catching and colour ringing of the godwits does not cause long-term harm to the birds. One Black-tailed Godwit is still being seen 26 years after it was colour ringed! 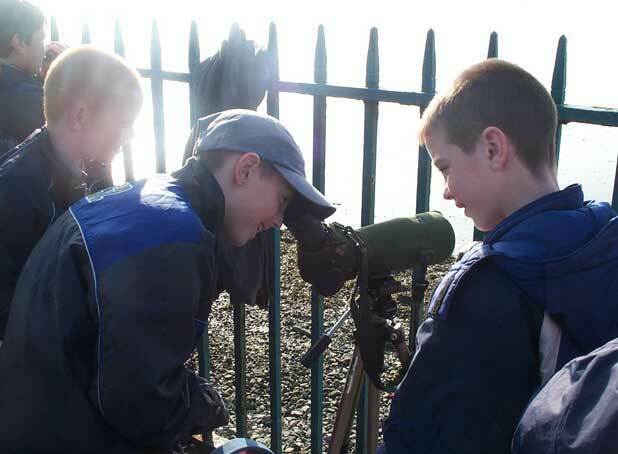 Since October 2006 Mr. Willie McSweeney's and Guðný Róbertsdóttir's Class pupils have been taking part in this exciting study and learning about the birds and wetlands in Cork harbour and Siglufjörður. Scoil Iosaef Naofa is situated right in the middle of Cork harbour and Grunnskóli Siglufjarðar is surrounded by godwit breeding habitat. Tómas Gunnarsson with Black-tailed Godwit chicks in Iceland. 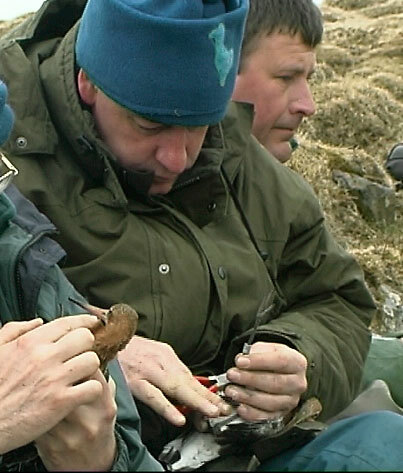 Pete Potts colour ringing a Black-tailed Godwit in Southern Iceland. The class send the sightings of colour ringed godwits seen in and around Cork harbour and Siglufjörður to two of the study organisers, Tómas Gunnarsson, in Iceland and Pete Potts in England. In return they send them information showing where and when the godwits were caught and colour ringed and where and when the birds were seen after that. 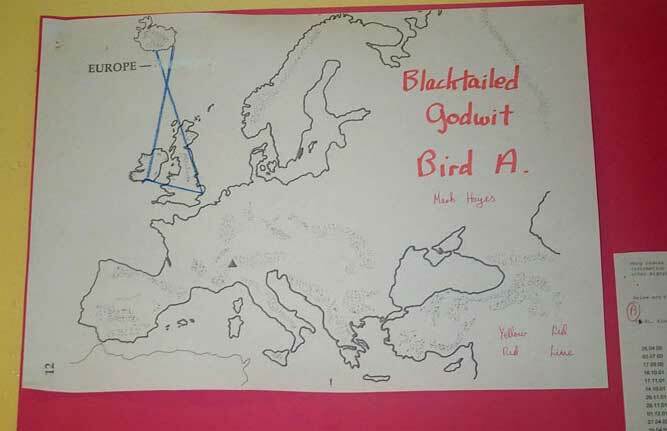 When the class gets a godwit life history a pupil "adopts" the bird and using the life history information draws lines on a map of Europe showing where it has been since it was colour ringed. 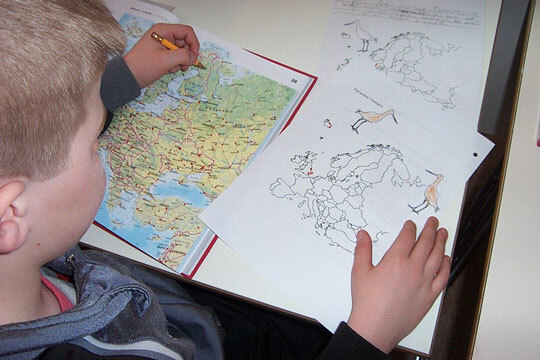 The map is then put up on the wall of the class. A red dot is also placed on a big map of Iceland showing where the Cork godwits were ringed and where the Siglufjörður godwits spend the winter. The classes has over 20 life histories of godwits seen in Cork harbour or ringed in Siglufjörður and they hope to get even more. 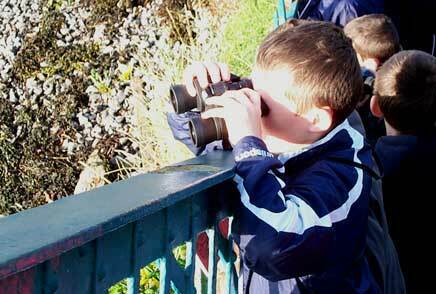 The pupils go out looking for colour ringed Godwits during the school year (September to May). 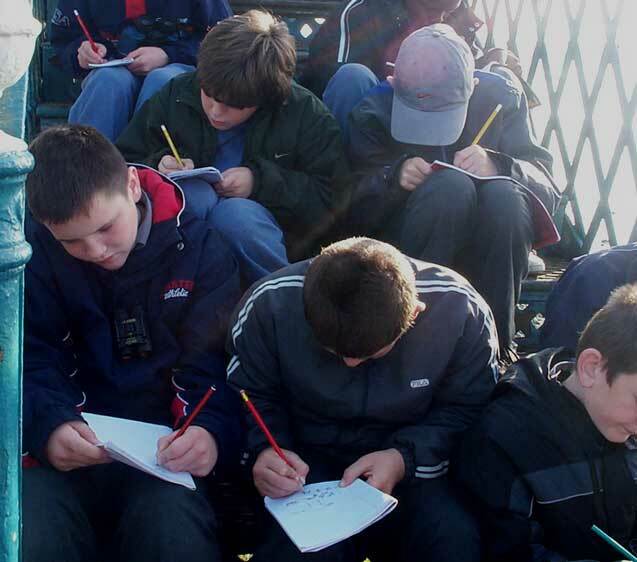 The Cobh pupils take the 15 minute train ride from Cobh to Glounthaune. The station platform at Glounthaune is perfect for studying the godwits and other wetland birds. 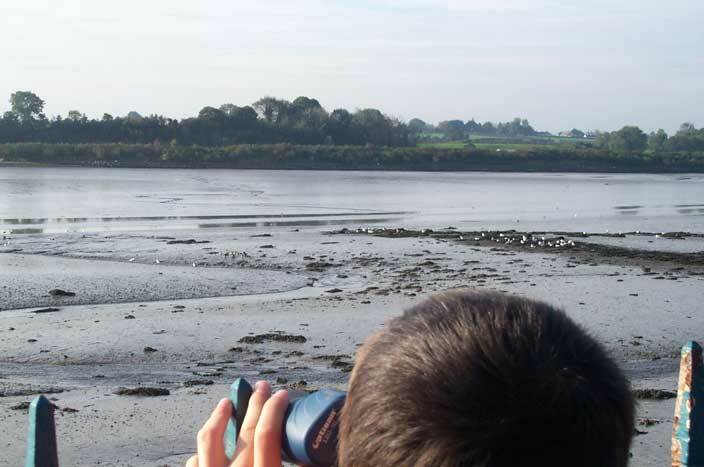 It overlooks one of the most important estuary areas for Black-tailed Godwits and other wetland birds in Cork harbour . They always have a great time and usually see plenty of godwits and other wetland birds up close.They try to have at least two trips to study the godwits each school year. One in the autumn or early winter when all the godwits have returned from Iceland and the second in March or April when the godwits are gathering before flying north to breed in Iceland. They always see at least some godwits as well as other wetland birds such as Redshanks, Curlews, Dunlin, Oystercatchers and Shelduck. 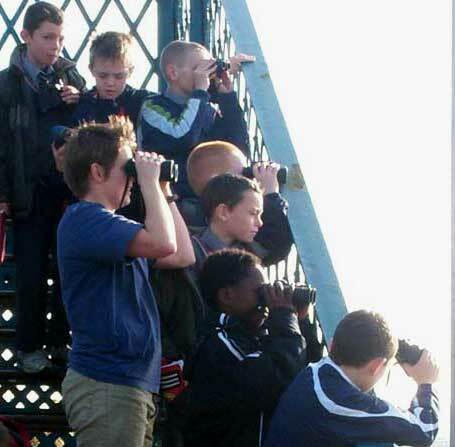 On one trip in April 2008 the whole class was lucky enough to see a colour ringed godwit really close through a telescope. In Siglufjörður the pupils of Grunnskóli Fjallabyggðar keep in touch with Scoil Iosaef Naofa during the time the godwits are in Ireland and then in late April and May they go out looking for the godwits as they arrive back to Siglufjörður to breed. Students from Grunnskóli Fjallabyggðar in Siglufjörður in May out looking for the first godwits to return from Ireland and other parts of Europe. 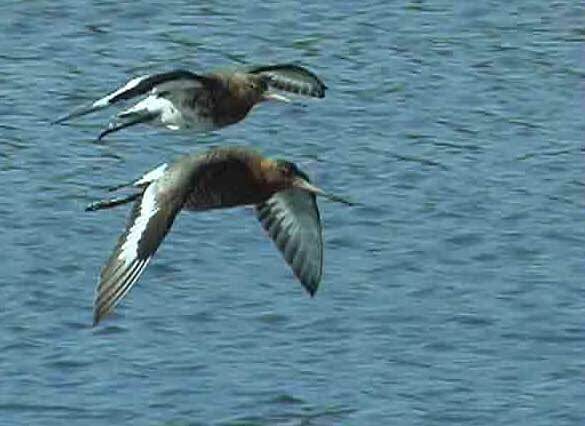 Two Black-tailed Godwits in flight. Daniel Hayhow examining mud samples from areas where the godwits feed. Daniel Hayhow, from the University of East Anglia, is doing his PhD on the behaviour of the Black-tailed Godwits on the south coast of Ireland has been a great help to the class. Providing colour ring sightings, updated on the movements of the godwits and helping with field trips. Note: The catching and ringing of wild birds in Ireland, including the Black-tailed Godwit, can only be carried out with a license from the National Parks and Wildlife Service. This type of research contributes to the conservation of wetland sites on which the godwits and other wetland fauna and flora depend. It will hopefully lead to the legal protection of these wetlands.